Chrome OS: what's the point? Has the shine come off Chrome? There's an old saying in marketing: sell the sizzle, not the sausage. Google's Chrome OS presentation reminded me of that. We spent ages watching Google grind up some testicles, bits of bone, chopped sawdust and the odd factory worker's finger before shoving them into a big machine, but nobody spoke about how tasty sausages are or fried up a few tasty links. We saw the sausage. Where's the sizzle? There was a telling bit in the post-launch Q&A, where the Google team were asked why someone should use a New York Times web app in Chrome when they could just go to the New York Times website. There was humming. There was hawing. I was half-expecting someone to say "Damn, we hadn't thought of that. Cancel the project!" with security goons rushing in to bring the session to a premature halt. That didn't happen, but it really was a good question. Chrome OS is undoubtedly clever and Google's giveaway of lots and lots of Chrome notebooks is very nice, but what exactly is it the answer to? I suspect the problem is the iPad and the rise of the tablets. Most questions to which the answer could be "Chrome notebook" can also be answered "iPad" or "Android tablet". What boots faster than a traditional PC (the answer to that one also includes "MacBook Air" and "Anything with solid state storage")? What runs web apps from an App Store? What sleeps and wakes instantly? What's very secure and very unlikely to get viruses? What's really portable? What has great battery life? What can access the enterprise systems from a secure yet friendly interface? Who lives in a pineapple under the sea? You get the idea. Even the Web Store looks like a very slightly tweaked iTunes. It's easy to make predictions that blow up in your face - remember "No wireless. Less space than a Nomad. Lame" about the iPod? - but while there are obvious benefits to enterprise customers, I'm struggling to see how this is going to appeal to consumers. Mobile phone subsidies will make it as cheap as chips if you look beyond the pricey data contract, I'm sure, but the networks subsidise netbooks, normal laptops and iPads, too. I really can't see why you'd want a Chrome OS notebook when you could buy a normal notebook and run the Chrome browser on it - or skip notebooks altogether and go with a tablet instead. Maybe it was just an underwhelming presentation and Google's got a marketing plan that's going to blow everyone's socks off. I do hope so, because more tech, more competition is always good. 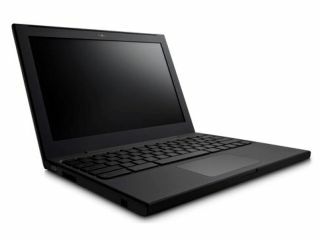 But I can't help thinking that Google's reinventing the netbook just as everybody who wants a netbook has bought one, and just as everyone who might have thought about buying one has either bought or started saving for a tablet. If I'm right, Google isn't shutting the stable door after the horse has bolted; it's erecting a precision tooled, state of the art stable door in an empty field.